Rachel Rose is currently Vancouver’s Poet Laureate. She has published four collections of poetry: Giving My Body to Science, Notes on Arrival and Departure, Song and Spectacle, and most recently, Marry & Burn. She is also a short story writer and an essayist whose work has been published in literary magazines and anthologies across Canada and the United States. Her poem, “Sunflowers” (among others), is featured in The Fiddlehead Autumn 2015 issue. This interview was conducted by Fiddlehead editorial assistant Emily Skov-Nielson by email in late November 2015. Emily Skov-Nielsen: Firstly, I’d like to ask a question about your poetic process: where does a poem begin for you — in other words, is it an image that first inspires you, a line or phrase, maybe a metaphor? Rachel Rose: A poem begins for me sometimes with a line or an image, or the juxtaposition of two images; sometimes there is an inciting incident, a scrap of conversation, a statistic, a trauma, an irritation. 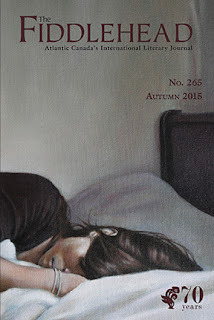 ESN: I can honestly say that your poem, “Sunflowers,” was my favourite from The Fiddlehead’s Autumn 2015 issue and one of the best elegiac poems I’ve read in some time. The opening stanza is so musical in its rhythm and with its alliteration, and there is of course the allusion to the timeless playground song/game Red Rover. This first stanza is almost like an incantation that pulls you into the poem. I’m wondering if you could provide some insight into your creative intentions regarding this opening. I know from my own experience that elegies can be incredibly difficult to write — with an elegy, there seems to be an increased potentiality for melodrama, sentimentalism, or veering towards the cliché; however, “Sunflowers” skillfully evades all of these poetic dangers. Was this a difficult poem to write for any of these suggested reasons? If not, what were some of the difficulties in writing this poem? RR: Thank you for your generous words about “Sunflowers.” This poem both tells and evades; at the beginning it hovers, like the hummingbird, then darts away — you may think you know the subject matter of the poem from that first playful stanza, but you are being led off course, distracted by the flight, and then, when you are not expecting it, comes the elegiac notes. Throughout, “Sunflowers” drops lines, says too much in parts, goes too hard and too far, breaking through as children do, roughly, when playing Red Rover. It confesses little, though it holds much pain between the lines. ESN: I’d like to draw attention to what was, for me, one of the most painful parts of the poem, the lines: “your hands / that an old boyfriend called / the ugliest hands I’ve ever seen on a woman.” This ruthless quotation that the speaker recalls, although heartbreaking, provides an interesting contrast and dynamic to the poem. Can you provide any insights regarding your choice to include this fierce, surprising moment? RR: There are things we are told that we carry with us forever, and that we pass on to others, because of their extraordinary ability to cut. This was one of those things, passed on — another kind of inheritance. ESN: There are several dropped lines in “Sunflowers” — what, creatively, does a dropped line enable you to do? RR: Dropped lines in this poem allow me to imitate the flight of hummingbirds, the nodding of flowers, the pattern of bees swarming, the reticence of speech that doesn’t trust its right to be spoken. ESN: The natural world is central to this poem — flower, bee, moon, and bird imagery are all present. Are these things that commonly inspire you and your writing, or are they particular to this poem and its subject matter? RR: The natural world is a source of deep inspiration in my work, though I don’t consider the urban world separate from nature. I grew up in some wild places, and what I found and experienced in the wild helped raise and shape me. ESN: Calling upon a quotation from “Sunflowers,” I’d like to end with a broader question regarding your thoughts on poetry, its practice and purpose: is poetry, for you, “honey to mitigate the sting / of what can’t be said”? RR: It would be more accurate to say that poetry, my poetry, includes honey to mitigate the sting of what must be said, of what I insist on saying. I try at least to comfort with some taste of sweetness, purity of form, of lyric image, to counteract the sting of the language, of what humans are capable of doing to one another.